Stylish and comfortable, Honda Activa has been wooing two-wheeler consumers since its launch in 2000. Honda Activa is the bestselling scooter in India with attractive design and features, which are apt for Indian roads and needs. It will not be incorrect to mention, Honda Activa is an all age and gender scooter. It is an easy-to-ride two-wheeler having a four-stroke, single cylinder engine with air cooling system. This highly reliable scooter features dual options of kick-starting and self-starting, making it best scooter for young and old. Activa is popular for offering comfy & stable ride in addition to trendy exterior and greatly controlled drive. Honda Activa scooter can be a best buy for anyone who wants to travel within the city, from home to office to anywhere else. 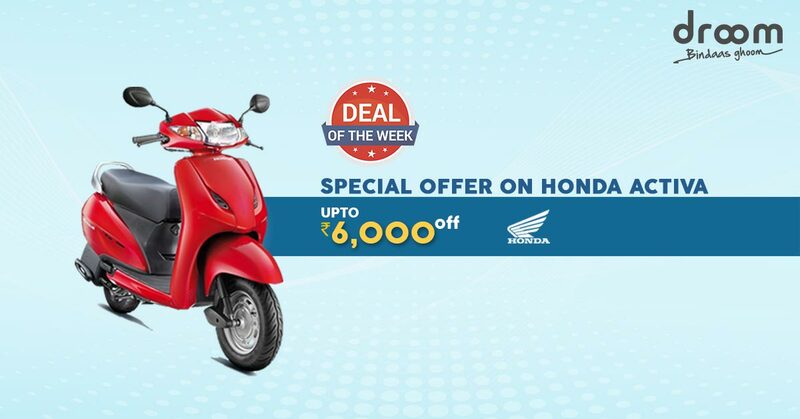 If you are planning to buy a two-wheeler, then used Honda Activa will be a wise investment. Used Honda Activa scooters offer better resale value, as rate of depreciation is lesser than the new one. You can choose to Honda Activa – I, an amazing model by the company with interesting features. Be ready to fly with 60 kmph mileage and combi brake system. To ensure shorter braking distance. It offers vibrant instrumental panel that provides required information at a glance. Tubeless tyres and long seat offer comfortable and enjoyable ride. It also has 18 ltrs of storage capacity, catchy tail light, new style muffler and hugger fender. This Honda scooter has everything you want as a rider. Also you can consider Honda Activa 3G 110cc is the latest model unveiled by the maker. This completely new model of Activa turns head with 110cc engine and many exclusive features like metal body, large storage space, 3D Emblem and combi brakes. Start your street tour with Honda Activa scooter deals from droom.in. Find some of the best scooter deals ever from a genuine seller. Buy Droom Automobile Services for Better Performance!